containing detailed per-lead pricing for hundreds of industries. The ServiceMagic Fee Schedule is a guide to where the money is. What are the most profitable industries? How much can I make or should I charge per lead/sale? What keywords should I focus on? ServiceMagic.com has done all the work for you. Service Magic provides cost per lead data on virtually all home services-related industries and some others including pet sitting ($10/lead), photo portraits ($12/lead), wedding DJ ($12/lead). If you are a SEO or web designer that wants to know how much a lead is worth to a customer, here is your answer. Service Magic has two different pricing structures. The numbers shown are the less expensive program, which involves pre-paid accounts (“Premier Pro”). The pay-as-you-go option is far more expensive (10-35%, an average of ~25% more per lead). This is called Lead Select. Keep in mind that the numbers shown may be 1/3 more than shown. And the most expensive lead is? With a per-lead price of $80/lead, real estate developers top the list. How are you going to use this data? Do you think this information is worth what this article says it is? Wow, nice information- some new opportunities for lead generation. Thanks downloaded. Another Good thing to review is the highest prices paid for PPC to determine a good niche to go after. Have just seen this thread and have also downloaded the zip file. We concentrate a lot on niche marketing – it’s something we find is very profitable for our business. 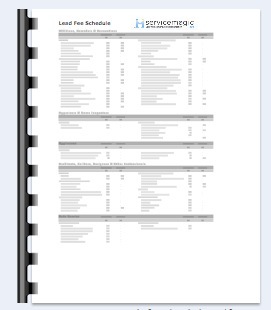 Great information, it’s always nice to know what they are charging per lead. Wow, what a great resource! I will definitely use this when pricing my next SEO or PPC Management project. Home remodeling can be so expensive! I’m looking for a great Denver garage door repair company in the area that will work with my budget. Thanks for the great article! Great info. Will definitely put this to use! Great article. Now I can have an idea of what to charge and what to pay for services as well. Thank you for this valuable resource. Keep up the good work! marble polishing Denver client of mine. Maybe its a subniche of general contractor. What do you think? Was just turned on to this – awesome. Any plans for an update?